World War Two games were an important part of a solider’s life. As a Second World War enthusiast and historical reenactor, I thought I might share an especially small and unknown historical niche in the history and hobby: Games. For women the top three games are: Contract Bridge, Auction, and Pinochle. For men the top three games are: Contract Bridge, Poker, and Pinochle. Getting access to cards was not difficult. The Red Cross distributed cards to soldiers in hospitals or in recreation centers. Families would also send a deck of playing cards out to soldiers. Families could purchase the decks of cards from local general or department stores. The top set is a reproduction. The bottom set is an original Red Cross set. 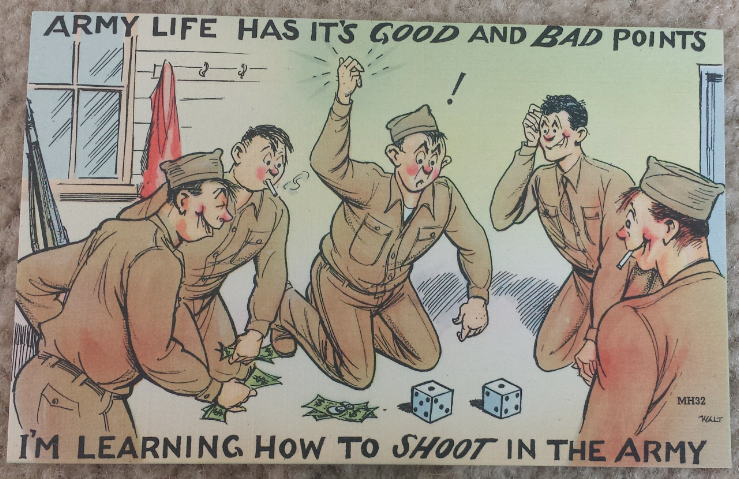 However, the number one game for soldiers during World War Two was undoubtedly: Craps. So popular was craps (and probably still is) that John Scarne , a professional magician and gambling authority for YANK magazine, worked out the odds. He then had printed 2,000,000 copies of the odds for service men to paste in their helmets. 1. Craps is an almost perfect gambling game: the shooter has a 49.293% chance of winning. 2. Soldiers gamble $300 million a month. 3. Most of their games are on the level. Meaning they are fair. Craps is thought to have been brought to new Orleans by French settlers. It is an offshoot of the British game Hazard. Players gather around a level surface and create a backstop (books are ideal). The players decide what the max. bet will be. The first player (known as the shooter) says the amount he will bet, puts the numbers of counters (or money) into the center and in the language of craps says, “ I’ll shoot three.” This means the shooter has a bet of three counters to win. At this point other players have the option to fade, or bet against the shooter by covering the bet and putting their money with the shooters (in the pot or kitty). One player can fade the whole bet or several can cover parts of it. Any part of the shooters original stake that is not covered must be withdrawn (dragged down) before the dice are rolled and no more counters must be bet than are in the shooters original bet. There are no official rules, but it is customary that no one can touch the dice until they have stopped and until everyone betting has seen them. It a dice is cocked, that is, resting in such a way that it is doubtful which face is uppermost, than the throw is declared void. If the first roll is a 7 or 11 (a natural), the shooter wins. If it is a 2, 3, or 12 (craps) the shooter loses. If it is a 4, 5, 6, 8, 9, 10 the shooter has to “make point” that is to roll again and again until the same number is rolled. If the shooter throws a 7 before he “makes point”, the bet is lost and the dice pass to the player on the left. The shooter can voluntarily pass on the dice at anytime between rolls. If the shooter wins he takes all the money in the pot if the shooter loses, those players who faded each take double the amount of money they put in the pot. (their original bet plus the shooters stake). If, for example the shooter has bet three counters and two players have bet one counter and two counters respectively, the player who has bet one counter takes 2 counters the player who bet 2 takes 4. In addition to the shooters opening stake bets, players can also bet among themselves as to whether or not the shooter will win (come right) or lose (come wrong). For example, after rolling a point, a shooter might make a bet to come right (win) on the next series of rolls. If for instance the shooter rolls a point of 5, he makes a come bet, than rolls an 11, this has no effect on the main bets in the pot. Which can only won by a 5 or a 7 –but it wins the “side bet” so to speak among other the other players because 11 is a natural and the throw is functioning as a a first roll. Besides dice and card games soldiers also had access to pocket-sized board-games. These board games were made by William F. Drueke and sons. Drueke was a prolific maker of chess and checker sets during between the 1920s-1940s. However, he also ventured into other gaming areas such as poker chips, dice, and casino equipment like roulette wheels. The board games Drueke produced were not covered by patents as they were centuries old (http://www.peterspioneers.com/WFD.htm). The two pictures below are of a World War II Volume 101 Checkers from the “Original Library of Pocket Games manufactured by William F. Drueke & Sons, Grand Rapids, Michigan is in original mailing box 5″ x 5”. Enclosed is the wooden checker board which is protected by a blue leatherette cardboard. The game is complete and comes with 13 red and 13 black markers (one extra than needed) and no instructions (apparently playing checkers is intuitive). However, it does mention that Kings are marked by turning over the marker to display the white-tip. Below is an example of a USO Chess Set. It is contained in a heavy 8″ x 8″ paper envelope chess and checker board and the cardboard playing pieces. The back of playing board is marked in red “USO Maneuvers Service“. The Maneuvers Service went out into the field to provide USO activities to the soldiers. This set is probably dated sometime in late 1941/early 1942. Below is an example of a Canadian YMCA Overseas Pocket Chess & Checkers Set. The board measures 7″ square. It comes with 28 one inch round cardboard playing pieces. It also comes with 30, 5/8″ round, cardboard playing pieces. One side is for chess the other for checkers. The board is a cardboard material as well. The game comes inside of a brown paper case which reads “Canadian Y.M.C.A. Overseas Pocket Chess and Checker Set”. The back side of this case reads “Serving Canadian Sailors, Soldiers, & Airmen”. The US Government also sponsored a military unit called the Special Services Division. This division was designed with providing recreational activities and entertainment for the troops. It provided a variety of different athletic equipment/gear and board games. Source: Personal Items and Individual Gear of GI (pg 134).